A ritual is best explained as a daily action you achieve that can help you build habits over a period of time. A ritual "is a sequence of activities involving gestures, words, and objects, performed in a sequestered place, and performed according to set sequence". The English word ritual derives from the Latin ritualis, "that which pertains to rite (ritus)". In Roman and religious usage, ritus was the proven way (mos) of doing something, or "correct performance, custom". The original concept of ritus may be related to the Sanskrit ṛtá ("visible order)" in Vedic religion, "the lawful and regular order of the normal, and therefore proper, natural and true structure of cosmic, worldly, human and ritual events". The word "ritual" is first recorded in English in 1570, and came into use in the 1600s to mean "the prescribed order of performing religious services" or more particularly a book of these prescriptions. The performance of ritual creates a theatrical-like frame around the activities, symbols and events that shape participant's experience and cognitive ordering of the world, simplifying the chaos of life and imposing a more or less coherent system of categories of meaning onto it. As Barbara Myerhoff put it, "not only is seeing believing, doing is believing." We are all looking for structure and balance in our everyday lives. Why not achieve this by adopting daily rituals and routines to achieve your goals. We all already have basic rituals or routines we do on a daily basis. For example, you have morning rituals of brushing your teeth, taking a shower, making morning coffee. If we apply these routines throughout the day it can alleviate a lot of stress from our lives and lead us to live happier and healthier lifestyle. One way a daily ritual can help your everyday life is by alleviating stress and anxiety. If you set yourself up to have a routine you do on a daily basis you are setting yourself up to win. Having a routine helps your mind focus on other things and leaves less to chance. They can also help you from overthinking which can take some of your daily anxiety away. This can also help declutter your mind and allow you to focus on one task instead of the multitasks we all experience every day. Having a daily ritual can also increase your confidence. You give yourself a sense of control and satisfaction every day upon completing your routine. You can start with small victories and work your way up. By starting small you guarantee yourself you can accomplish a goal and set the forefront for future achievements. 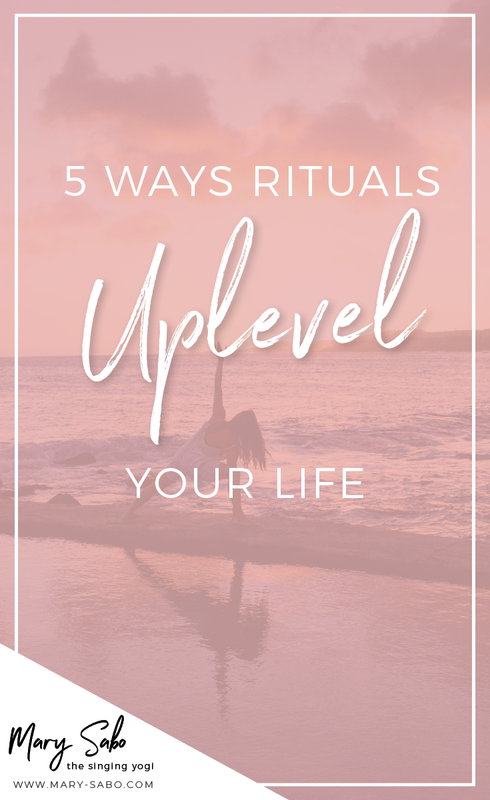 A daily routine is all about up-leveling your vibe for a richer life. By giving yourself a sense of meaning. We make commitments to ourselves to achieve daily goals. Holding yourself accountable for your actions can also help better your life. You can even tell a friend or colleague about a daily ritual you have started and see if they can help you remain accountable for completing it. Having a daily ritual increases your chance of success. Most successful people are great at planning and setting goals. Lastly, having a daily ritual can even help you face your fears. Set some goals or rituals that you are not sure that you can achieve. When you do face them head on they will no longer negatively affect your life. This can lead to an increase of your self-esteem and self-worth. Having a daily ritual or routine can have a dramatic effect on your everyday life. Nothing is too big or too small and everyone you adopt can have a powerful impact. What rituals are you willing to try? 1. Wake up at 5:30 + stretch to start the day. 2. Set an intention for your day - writing it down somewhere consistent before you start any work. 4. Do a braindump each morning when you wake up and/or evening before you go to bed to get your head cleared out. 7. Shower each night at the time when you are ready to turn off - my nightly shower signifies that it's time to put down my work and spend time with those I love. 8. Light a candle before writing, reading, thinking to inspire a mood. 10. Keep a notebook by your bed and every night write your "let it go" list - the things you need to let go of in order to find more peace.